How to write compelling captions - Wylie Communications, Inc.
Too often, editors crank out captions (aka cutlines) in the 15 minutes before happy hour on a Friday night. “No task involved in producing a newspaper has a greater disparity between its importance to the reader and its attention from most newsrooms than writing cutlines,” writes Steve Buttry, American Press Institute’s director of tailored programs. Images get the most viewership on a print page. (Online, eyetracking is very different.) That makes the caption, or caption under the image, a power point for communication. Captions get 16 percent more readership than text. Telling students what to look for in a picture increased comprehension, according to research by W.H. Levie and R. Lentz. Removing the captions from a series of cartoons reduced recall by 81%, according to a study by Richard E. Mayer, et al. And it reduced problem solving, or the ability to apply the information, by 66%. Text that’s larger or bolder than body copy gets more readership. Caption style at most publications stands out from the text. As a result, captions offer an opportunity to draw the reader in and communicate to flippers and skimmers. “(Captions) can be to stories what trailers are to movies — intriguing, compelling previews,” says Monica L. Moses, deputy managing editor/visuals for the Minneapolis Star Tribune. So don’t slap yours together at the last minute. The reader can easily tell what the image is. Because you’re not writing captions to explain what’s in the picture. You’re writing captions to draw readers in and communicate to flippers and skimmers. 4. Deliver a key message. Encapsulate one of your key ideas into the caption. More people will get it than if you just run it in the body copy. 5. Include a catchline. A catchline is a mini “headline” for your caption. Adding one increases caption readership. 6. Complement the other display copy. Captions work as a package with headlines, subheads, callouts and the other display copy on the page. Don’t repeat or contradict what you say in the other display elements. 7. Answer reader questions. If the CEO is wearing a cast, explain why. Otherwise, readers will be distracted by wondering. 8. Use a special typeface. Make the caption larger or bolder than the text. That will increase readership. I like a bold san-serif type, such as Arial, for captions. 9. Use the present tense. Write your cutline as if it’s happening now. 10. Keep it short. Limit the depth to one inch. If your caption doesn’t look brief and scannable, it will lose its properties of attraction. 11. Avoid awkward navigation. If you’re writing “Bottom photo, clockwise from top left,” there’s too much going on. 12. Expand the caption into a mini-story. Given the power of images and captions, why not run an entire super-short story under the photo? Cover the 5 W’s, or at least the who, what, when and where. That will transform your photos and captions into little information modules. Want more tips and techniques for writing headlines and other display copy that draw readers in, break copy up — even reach nonreaders with words? 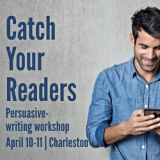 If so, please join me at Catch Your Readers — our two-day persuasive-writing workshop on April 10-11 in Charleston, South Carolina. There, you’ll learn to how to put your messages where your readers’ eyes really are. You’ll leave with the skills you need to reach “readers” who spend as little as 10 seconds with your piece. Save $100 with our group discounts. Peter S. Houts, Cecilia C. Doak, Leonard G. Doak, Matthew J. Loscalzo, “The Role of Pictures in Improving Health Communication: A Review of Research on Attention, Comprehension, Recall, and Adherence” (PDF), Patient Education and Counseling, vol. 61, 2006, p.173-190. Richard E. Mayer, William Bove, Alexandra Bryman, Rebecca Mars, and Lene Tapangco, “When Less is More: Meaningful Learning From Visual and Verbal Summaries of Science Textbook Lessons,” Journal of Educational Psychology, Vol. 88, No. 1, 1996, pp. 64-73.